The project applicants for DR08-0003-R are exploring a revised configuration of their project that was denied by the El Dorado County Planning Commission in February 2018. The previous project was seeking a design review: adding a third building, but reducing overall square footage of the commercial space. Two buildings were proposed to be fast food drive-thru restaurants, and a third building that would be a non-food retail space. The revised proposal is to eliminate one of the fast food buildings, and returning to the previously approved two building configuration, again with reduced square footage. One building is proposed to be a fast food drive-thru, the second building will be a non-food retail space. By removing the third building the applicant suggests that they would be able to accommodate RV parking. The applicant is conducting a public outreach meeting with El Dorado Hills residents on June 26, 2018, at 6:00PM at the Holiday Inn Express in El Dorado Hills Town Center. The El Dorado County Planning Commission has scheduled to hold hearings on three significant projects impacting El Dorado Hills, on December 14 2017, starting at 8:30AM in Placerville. The order of the hearings has not been determined. Public Comment NEEDS TO BE RECEIVED no later than December 13 2017. (4) Revisions to the approved Town Center East Development Plan incorporating multifamily residential use, density, and related design and development standards for the proposed 214-unit apartment complex within Planning Area 2 of the Town Center East Development Plan. 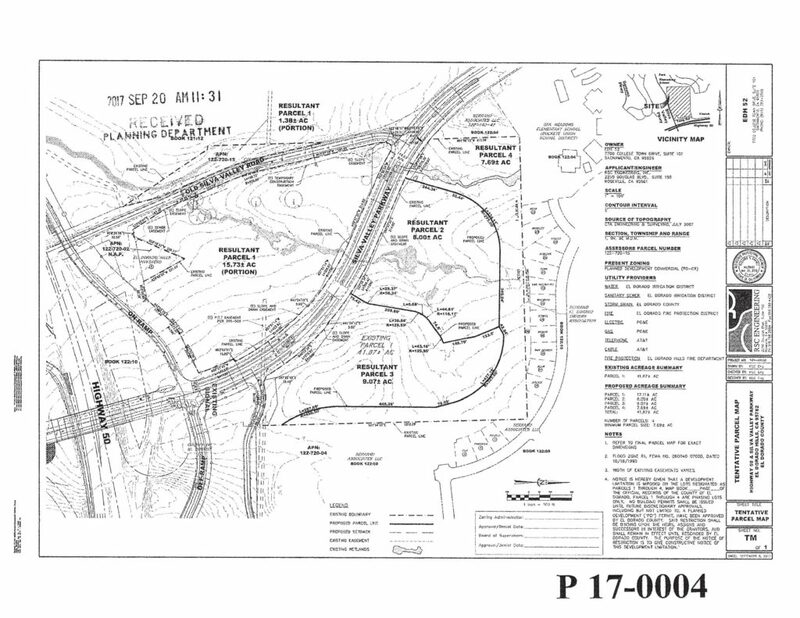 *This is a notice of intent to adopt the negative declaration or mitigated negative declaration that has been prepared for this project and which may be reviewed and/or obtained in the County of El Dorado Planning and Building Department, 2850 Fairlane Court, Placerville, CA 95667, during normal business hours or online at http://edcapps.edcgov.us/Planning/ProjectInquiry.asp. A negative declaration or mitigated negative declaration is a document filed to satisfy CEQA (California Environmental Quality Act). 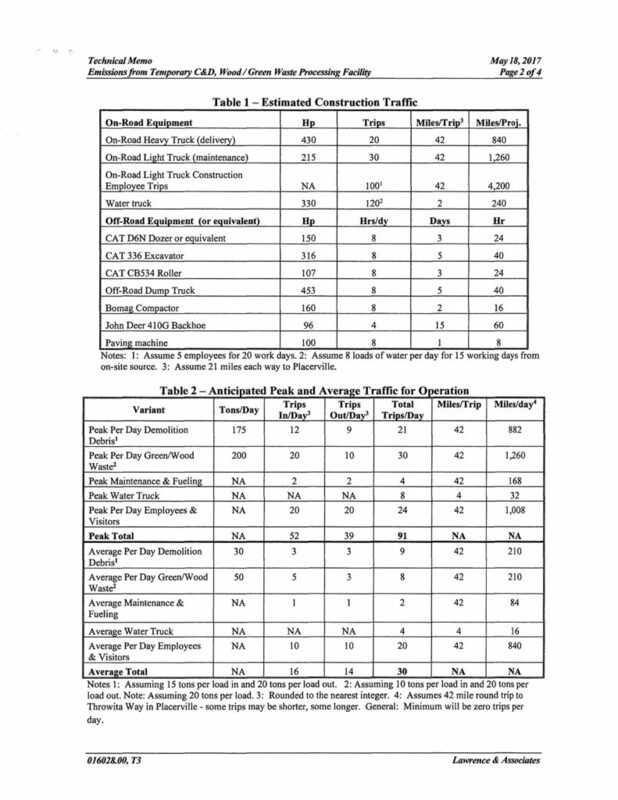 This document states that there are no significant environmental effects resulting from the project, or that conditions have been proposed which would mitigate or reduce potential negative effects to an insignificant level. 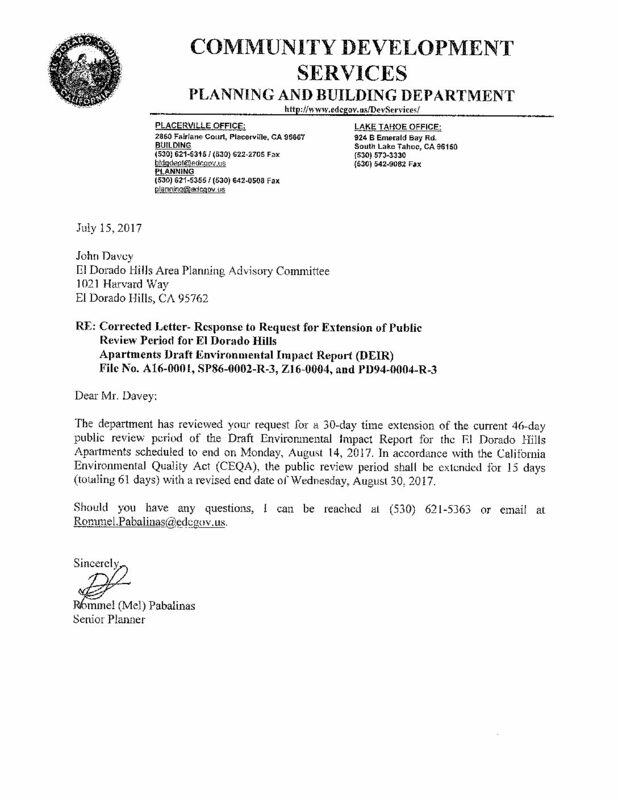 EDH APAC sent this letter to El Dorado County Community Development Agency / Development Services Department, Planning Division on August 31 2017 – no response has been received. The draft mitigated negative declaration for the PD16-0003 project addresses environmental issues including Aesthetic/Visual, Air Quality, Biological Resources, Drainage/Absorption, Flood Plain/Flooding, Forest Land/Fire Hazard, Geologic/Seismic, Noise, Public Services/Facilities, Traffic/Circulation, Vegetation, Water Quality, Wetland/Riparian, and Land Use. 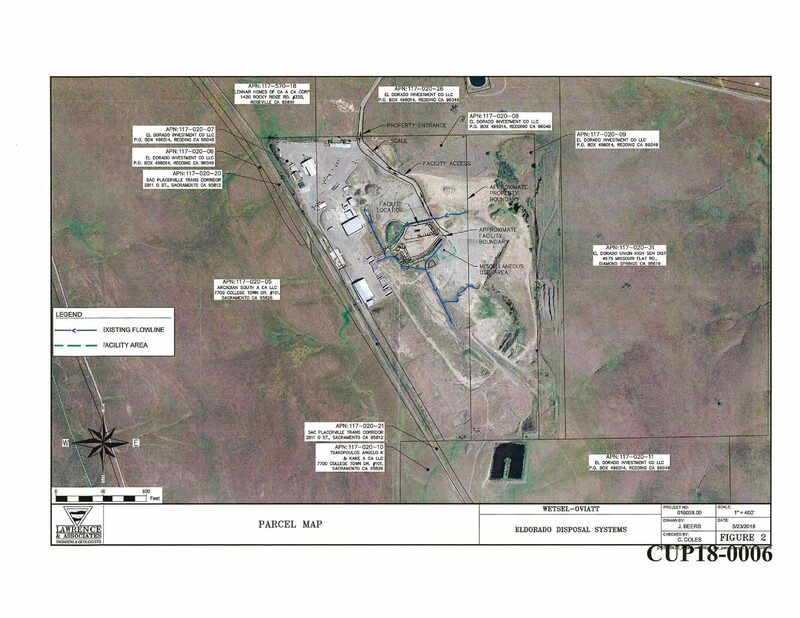 No hazardous waste sites are located within the vicinity of the project. Mitigation has been identified which would reduce potentially significant impacts to a level of insignificance. 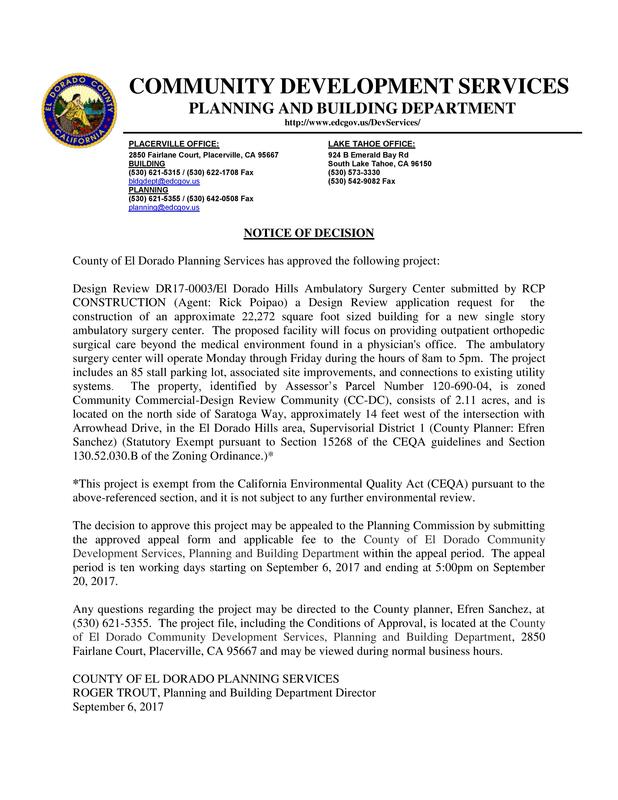 *This is a notice of intent to adopt the negative declaration or mitigated negative declaration that has been prepared for this project and which may be reviewed and/or obtained in the County of El Dorado Planning and Building Department, 2850 Fairlane Court, Placerville, CA 95667, during normal business hours or online at http://edcapps.edcgov.us/Planning/ProjectInquiry.asp. A negative declaration or mitigated negative declaration is a document filed to satisfy CEQA (California Environmental Quality Act). This document states that there are no significant environmental effects resulting from the project, or that conditions have been proposed which would mitigate or reduce potential negative effects to an insignificant level. The public review period for the negative declaration or mitigated negative declaration set forth in CEQA for this project is thirty days, beginning November 14, 2017, and ending December 13, 2017. 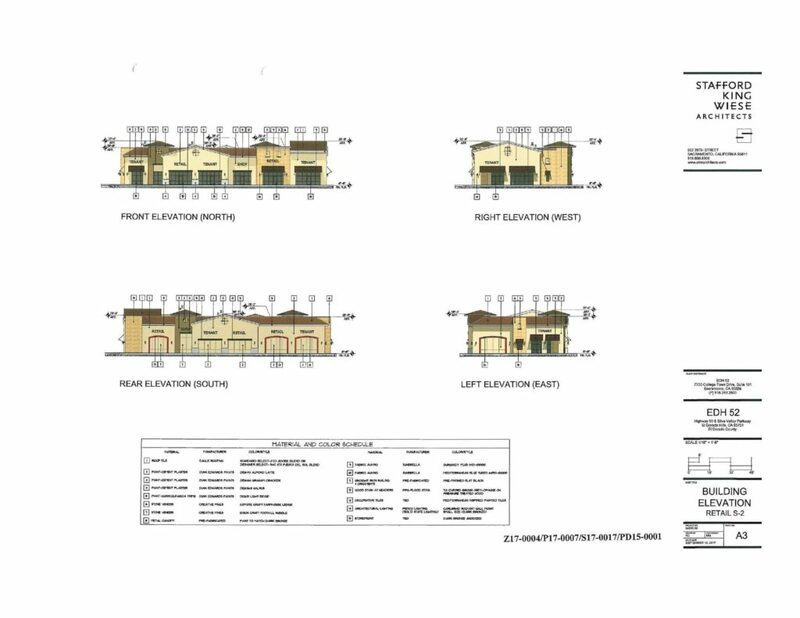 An application has been submitted to El Dorado County, and posted on the project status page on October 13, 2017 by RSC Engineering Inc on behalf of EDH 52 GP for a commercial center consisting of a total of 290,000 square feet in the Silva Valley Parkway and Tong Road area. 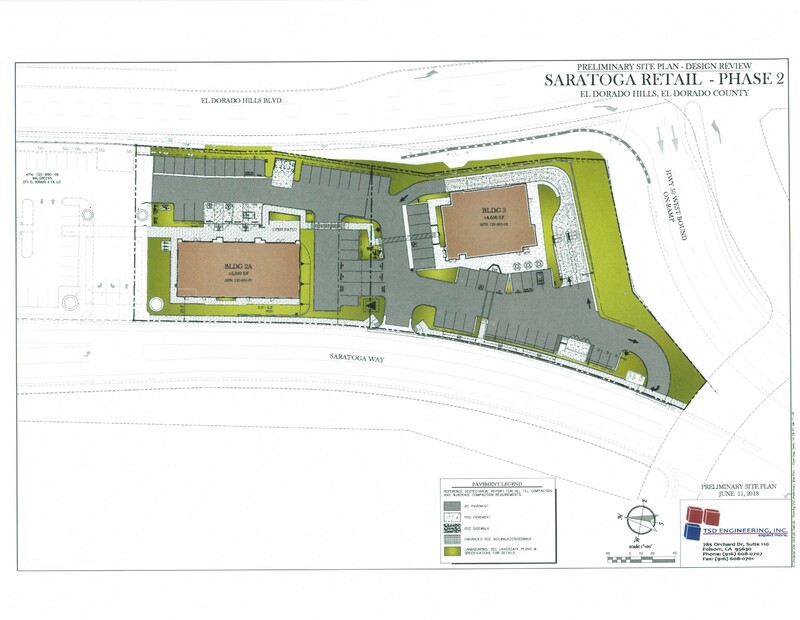 The plan provides details for components involving a hotel, restaurant with drive thrus, a grocery store and a self storage facility. The applicants seek three new entitlements to the project, which include a rezone, tentative parcel map, and conditional use permit. 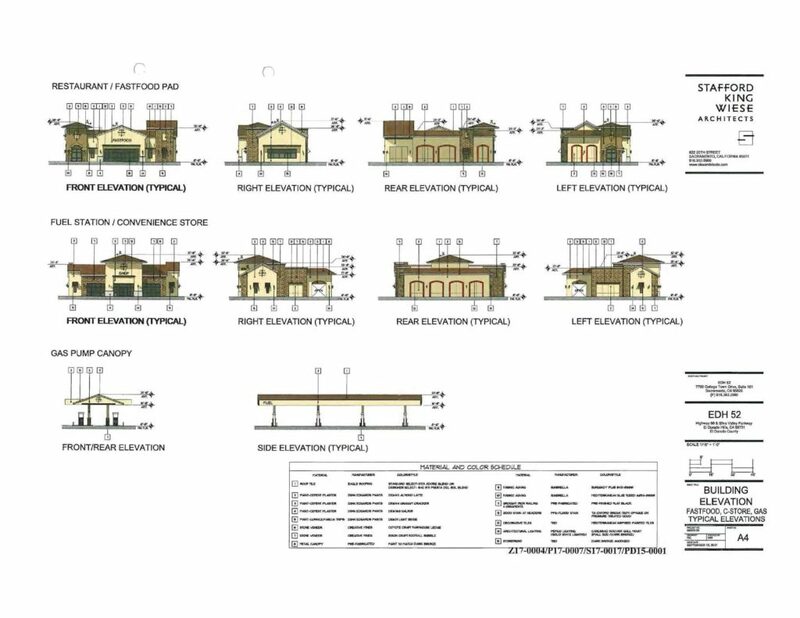 The owner is requesting approval to construct two (2) new commercial centers (collectively, the “Project”) in El Dorado County on APN 122-720-15. The property is located north of Highway 50 and Tong Road, east of Old Silva Valley Parkway, and is bisected by Silva Valley Parkway. 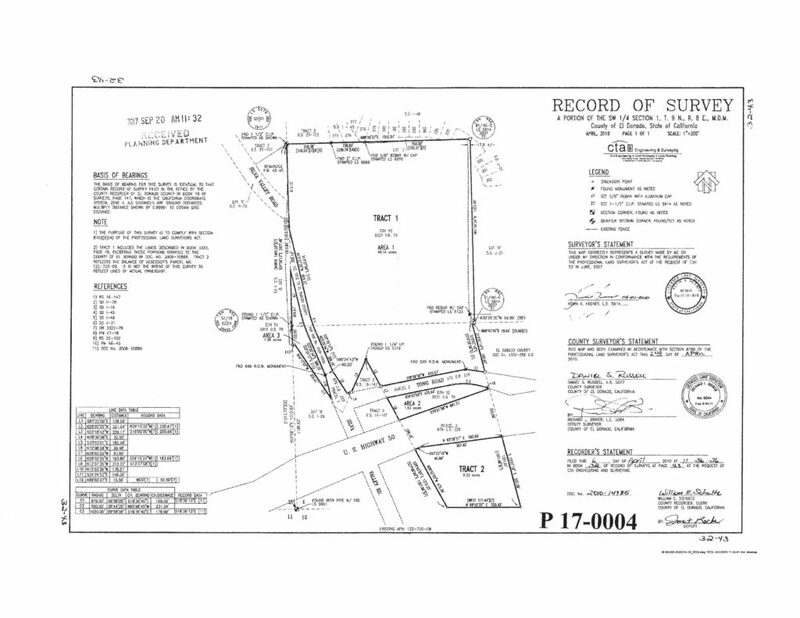 The northern portion of the property is approximately 17.07 acres (North Site) and the southern portion is approximately 15.73 acres (South Site), net of the right of way for roads. There is a 7.69-acre area on the North Site for the right of way associated with the future extension of Country Club Drive. There is a 1.3 8-acre open space area west of Old Silva Valley Road that will not be developed. The County is reviewing the owner’s request as a single application and project for local entitlement and California Environmental Quality Act purposes. However, the owner views the North Site and the South Site as two distinct projects, and each constitutes a separate “integrated development” pursuant to El Dorado County Code Section 130.16.120. Accordingly, the owner will seek separate wetlands permits from the Army Corps of Engineers for each. 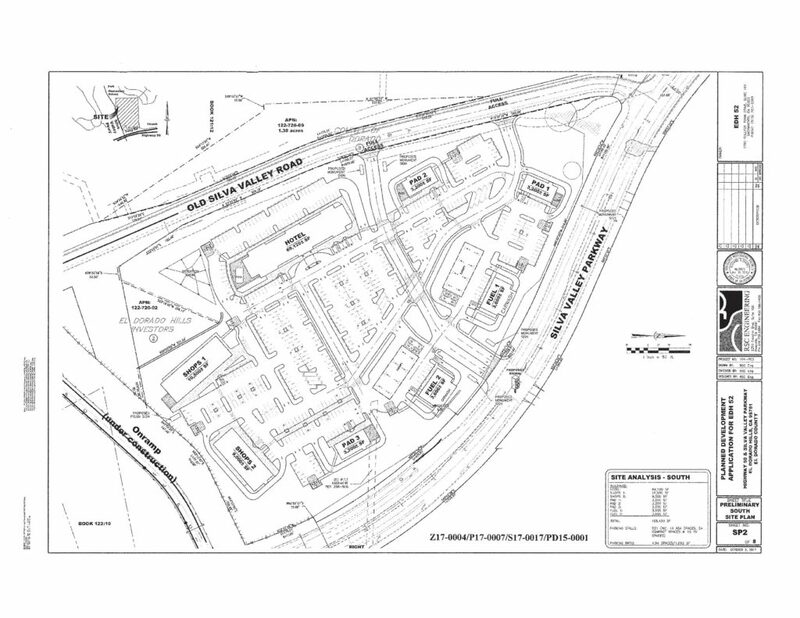 The maximum building area for the South Site will be approximately 110,000 square feet and may include the following uses: hotel, drive through uses, gas station with car wash, grocery, pharmacy, retail, food uses, outdoor patio, medical office, surgery center, office, technical school, outdoor storage and outdoor sales. The maximum building area for the North Site will be approximately 180,000 square feet and may include self-storage, grocery, and other commercial uses. The Project requires a Planned Development application because the property is zoned PD-CR. 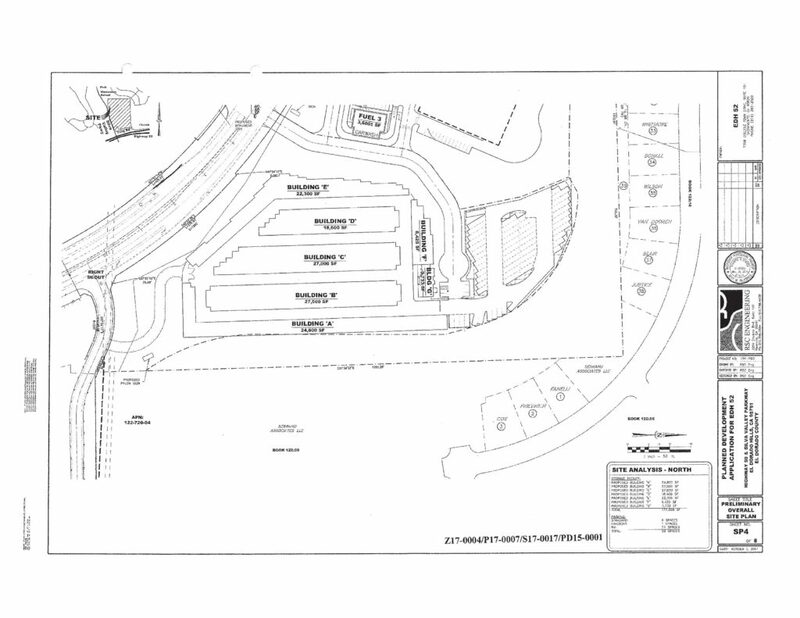 A rezone is proposed to PD-CC to allow more uses primarily seen in a shopping center setting and to allow a self-storage use with the approval of a conditional use permit. 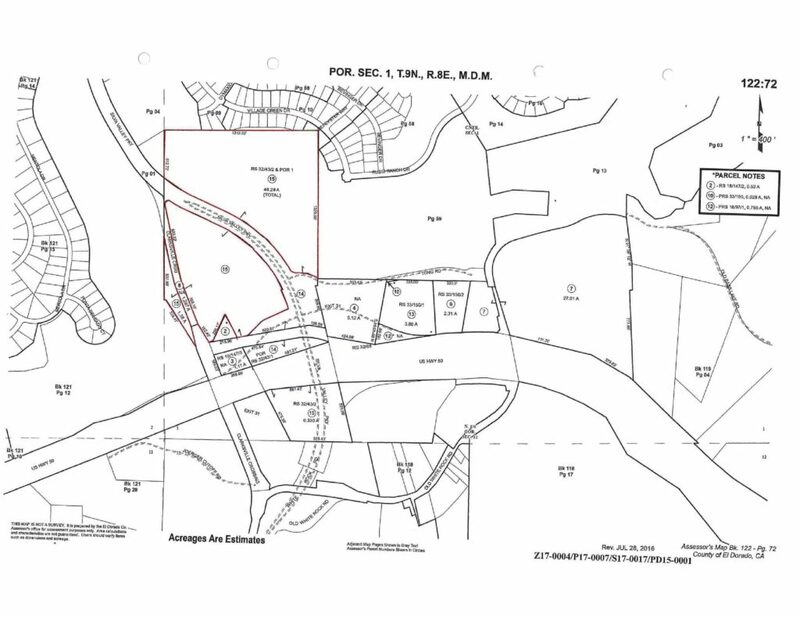 In addition, a design review permit will be required for signage and a tentative parcel map is proposed to subdivide the parcels further for purposes of sale, lease or financing of the property. 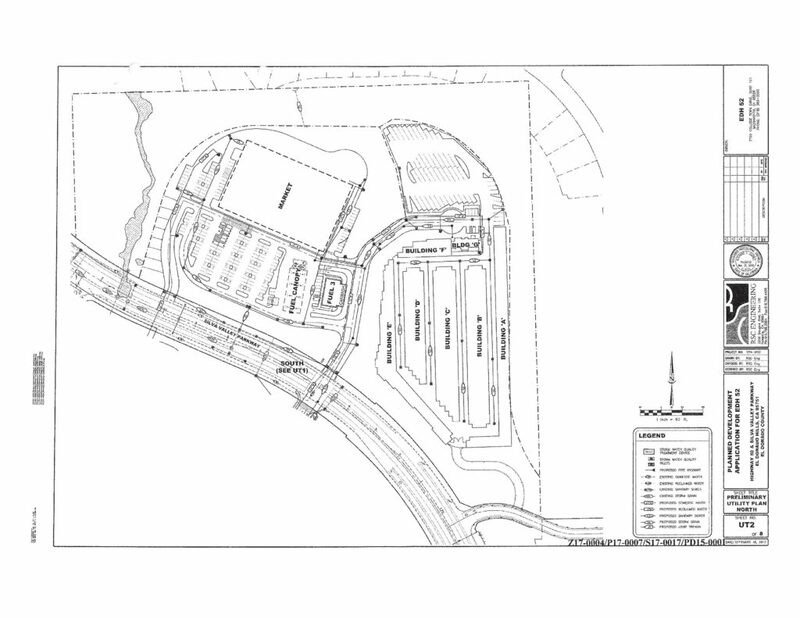 The maximum building area for the South Site will be approximately 110,000 square feet and may include the following uses: hotel, drive through uses, gas station with car wash, grocery, pharmacy, retail, food uses, outdoor patio, medical office, surgery center, office, technical school, outdoor storage and outdoor sales. The maximum building area for the North Site will be approximately 180,000 square feet and may include self-storage, grocery, and other community serving commercial uses. The owner is also requesting certain deviations from Chapter 130.16 of the County Code for the proposed monument signs, including a reduction in the minimum separation between monument signs, an increase in the maximum number of signs allowed per street frontage, an increase in the maximum allowed area, and an increase in the maximum allowed height. The developer is proposing six (6) 28 foot tenant monument signs allowing advertising from either commercial center. Each monument sign will have one (1) featured tenant panel and six (6) shop tenant panels. The proposed area for each monument sign is 242 square feet. The monument signs -3- will have a stone veneer base, fabricated aluminum panels, and texcote finish to compliment the color scheme of the commercial centers. Tenant names and logos will be routed out with acrylic push-through graphics and vinyl film overlays. Tenant names will be internally illuminated with white LED lights. Colors will comply with tenant specifications. Building signs will be a part of a separate sign permit and are not proposed at this time. It is anticipated that the Project site will have multiple points of access. A traffic signal is proposed at the main driveway and Silva Valley Parkway to provide access to both the South Site and the North Site. 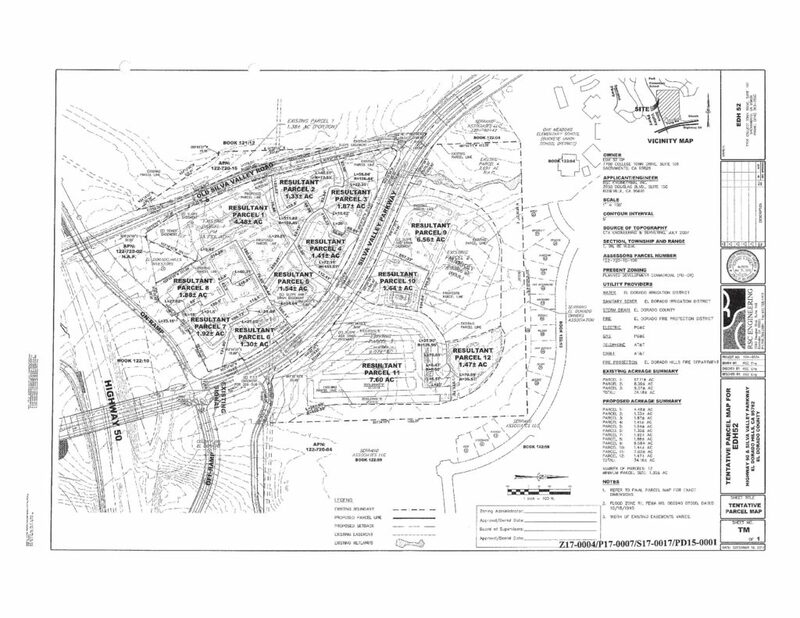 A right in and right out access driveway is proposed on Silva Valley Parkway north of the signalized driveway and at the old Tong Road location to provide access to the North Site. Two full access driveways are proposed on Old Silva Valley Road to provide additional points of access to the South Site. The Project is designed to allow either the North Site or the South Site to develop independent from the other. Mass grading of each site to accommodate future development will occur in the first phase of development, including filling of the permitted wetlands and permitted tree removal. In the event the South Site develops first, utility crossings under Silva Valley Parkway will be constructed as part of the South Site infrastructure work to serve the North Site. In the event the North Site develops first, interim facilities will be constructed on the North Site. The second phase will include construction of the parking, landscaping, lighting, utility infrastructure, and driveways designed to support the buildings. Site improvements will be constructed in various phases depending on the extent of development occurring at any given time. Buildings can be started once site improvements are sufficiently completed to allow construction and emergency fire access. 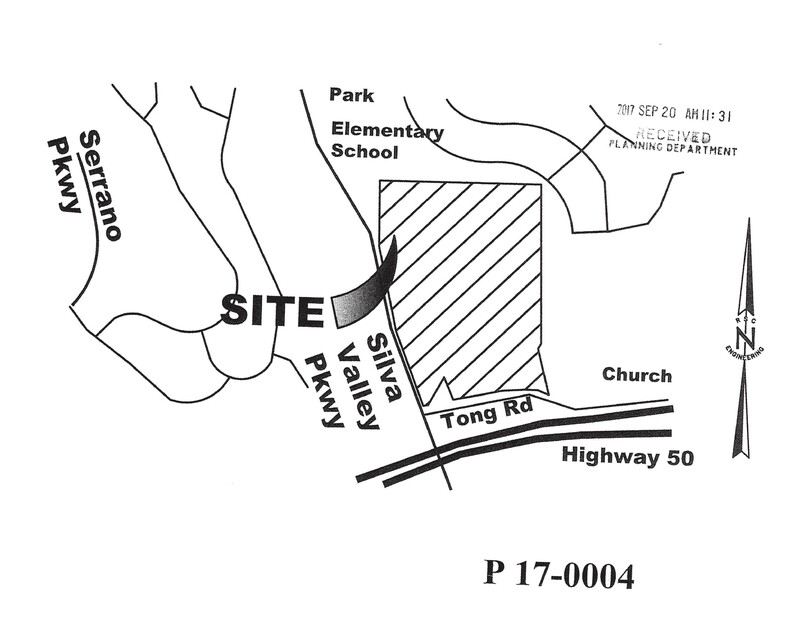 A right in and right out access driveway is proposed on Silva Valley Parkway north of the signalized driveway and at the old Tong Road location to provide access to the North Site. Two full access driveways are proposed on Old Silva Valley Road to provide additional points of access to the South Site. A reservation for 7 .65 acres of future right of way is proposed along the outer boundary of the North Site. The project seeks to be annexed into the El Dorado Irrigation District for water and sewer service. 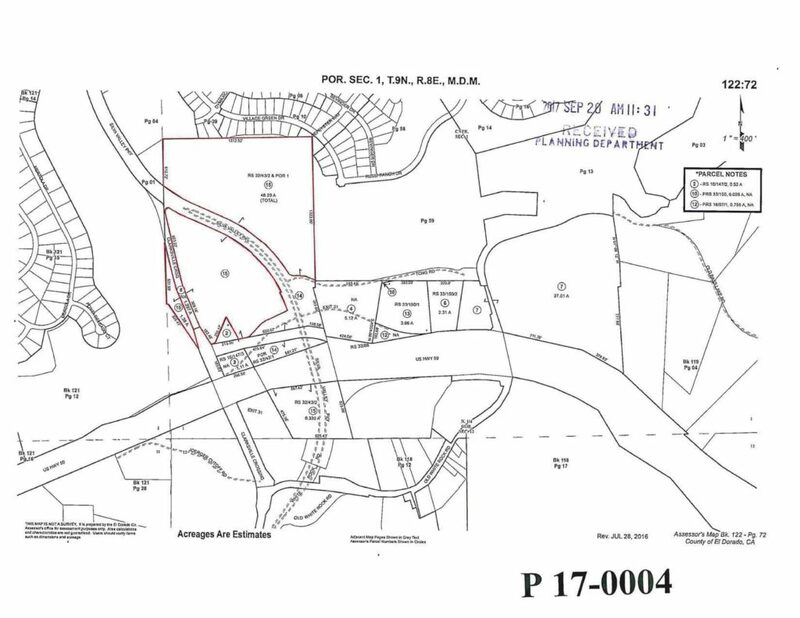 Application Packet P17-0004 was filed on September 20 2017 by RSC Engineering, Inc. of Roseville on behalf of property owner EDH 52 GP of Sacramento for a Parcel split of property located along Silva Valley Pkwy near Highway 50 and Tong Rd. in El Dorado Hills. The Application status can be viewed online. The single parcel was bisected by the re-aligned Silva Valley Pkwy interchange. The applicants seek to split the property into four parcels. The northern parcel will be subdivided into 3 parcels, one for the future Country Club Dr. extension and 2 additional parcels for finance purposes. 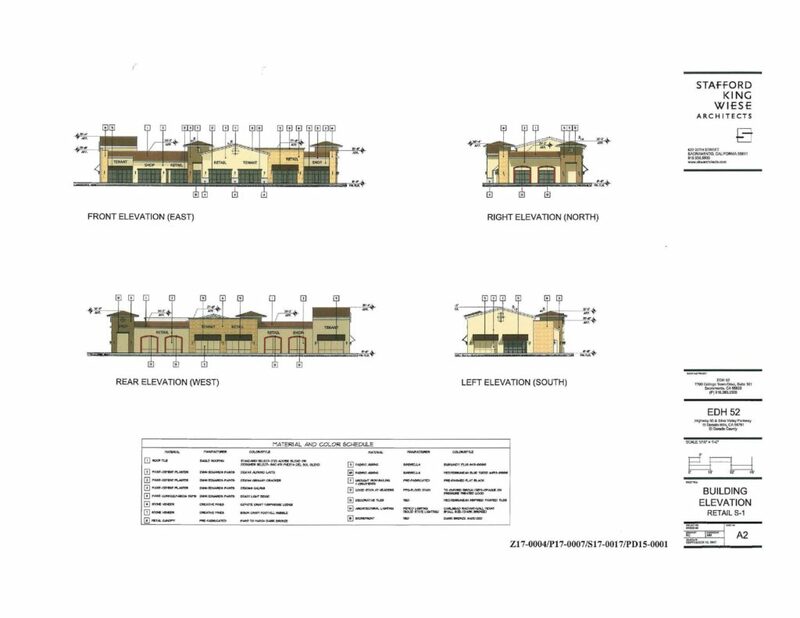 PLANNED DEVELOPMENT FOR A NEW RETAIL CENTER AT 122-720-09 ON 48.14 ACRES THAT WILL BE BISCECTED BY THE FUTURE SILVA VALLEY PKWY INTERCHANGE AND ROAD REALIGNMENT. NORTH SIDE WOULD BE 24.77 ACRES AND SOUTH SIDE WOULD BE 16.21 ACRES. MAXIMUM BLDG AREA WOULD BE APPROX 350,000 SQ FT AND COULD INCLUDE HOTEL, DRIVE THRU, GAS STATION, GROCERY, PHARMACY, RETAIL AND FOOD USES. PD IS TO BE APPROVED BY THIS APPLICANT AND LIKELY SOLD TO SOMEONE ELSE TO DEVELOP. PROJECT WILL REQUIRE AN EIR. The APAC Document section for EDH 52 can be found HERE. 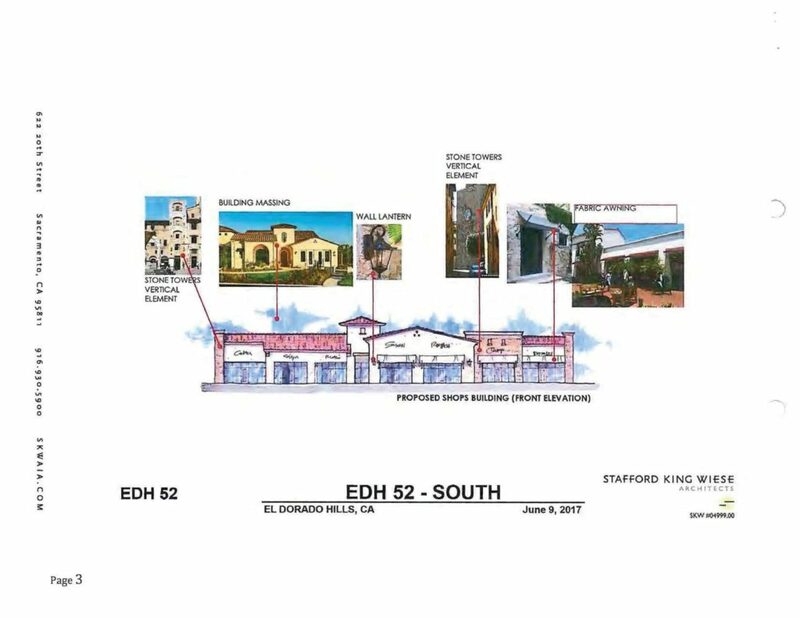 The El Dorado Hills Village Life has a new article regarding the August 9 2017 APAC meeting, focusing on the El Dorado Hills Apartments at Town Center East. 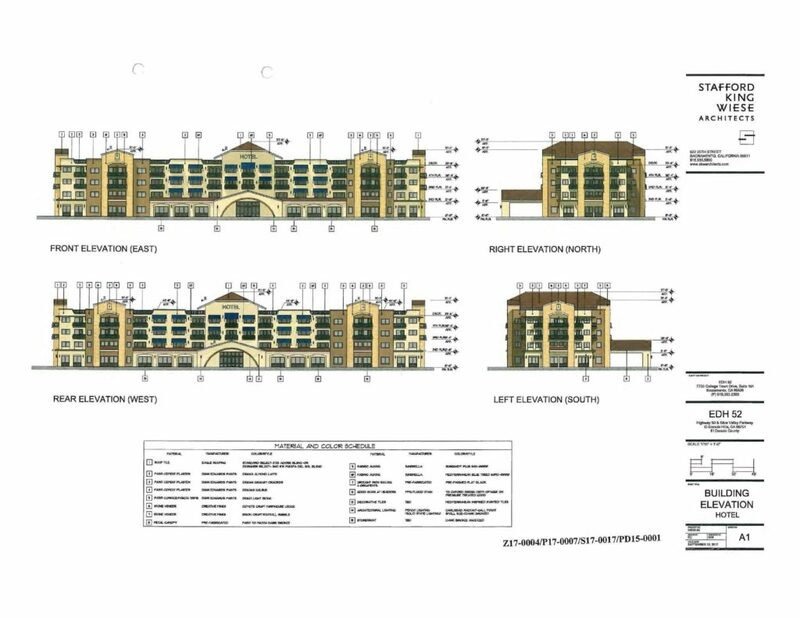 A Stockton-based developer went back to the architectural drawing board to reduce the density of its original plans for the apartment complex proposed on a vacant 4.6-acre lot in the heart of El Dorado Hills Town Center. Voting members of the Area Planning Advisory Committee, which studies land use projects and gives recommendations to the El Dorado County Planning Commission, voted against the project last Wednesday night and encouraged the Planning Commission to do the same. Planning commissioners received a project presentation last Thursday but did not vote. 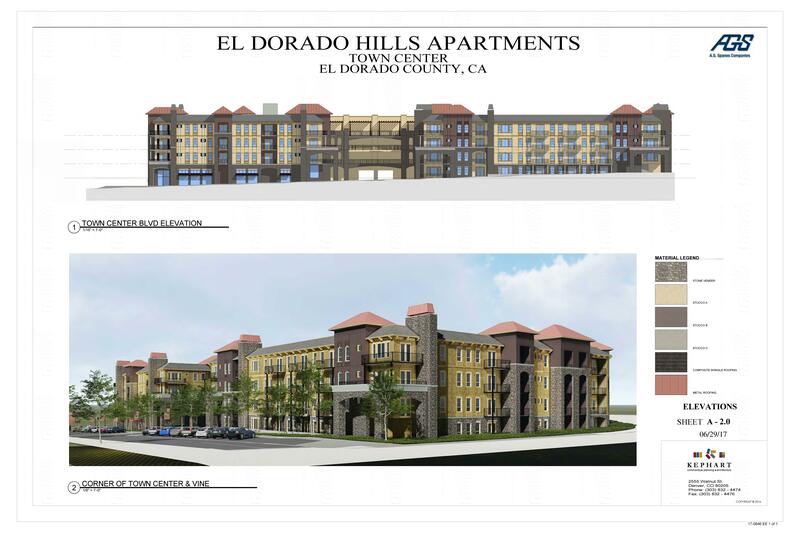 The El Dorado County Board of Supervisors will ultimately vote to approve or deny the El Dorado Hills Apartments project, which needs a General Plan amendment since the project calls for 47 dwelling units per acre. The parcel’s current General Plan land use designation allows a maximum of 24. When the project was first proposed in 2014 developers designed it with 56 units per acre. The four-story luxury apartment complex is 15 percent less dense today, with 214 units, ranging from studio to one-bedroom and two-bedroom apartments. Representatives from developer Spanos Corporation spoke at an APAC meeting last Wednesday night inside El Dorado Hills Fire Station 85 ahead of the vote. The project would consist of two, four-story apartment buildings, outdoor recreation areas and an informal open space area. There would also be a five-story parking structure that would house 411 enclosed parking spaces for residents, 22 motorcycle spaces and 54 guest spaces. Spanos Corp. Division Manager Jeff Morgan said, “We went back to the drawing board. We believe in this project.” He described it as “Old World architecture,” blending in with Town Center’s aesthetics. As in 2014 it was described as an ideal place for empty nesters and young professionals — “A lifestyle by choice, that is maintenance free with amenities,” Morgan explained. Three years ago Spanos Corp. officials said rents would range between $1,600 to $2,200 per month. Davey said the committee was also concerned about traffic. Several residents in the audience Wednesday night asked questions, uneasy that 54 guest spots wouldn’t be enough and would impact the already limited parking in Town Center. Morgan said the development company “used historical data” to determine how many guest spaces are needed. “It’s a substantial number,” he added. “This parking ratio works well in our other communities.” When asked, Morgan said Spanos does not have a similar project in the greater Sacramento area but has many across the country. There were also concerns about noise and the potential loss of community events, such as the Santa Run, fireworks, concerts and farmers market. The El Dorado County Community Development Service Planning And Building Department has issued the following Initial Consultation notice to concerned agencies in El Dorado County, regarding the proposed General Plan Amendment A16-0001, Specific Plan Amendment SP86-0002-R, Rezone Z16-0004, and Revision to Planned Development Permit PD94-0004R for the El Dorado Hills Apartments at Town Center East. 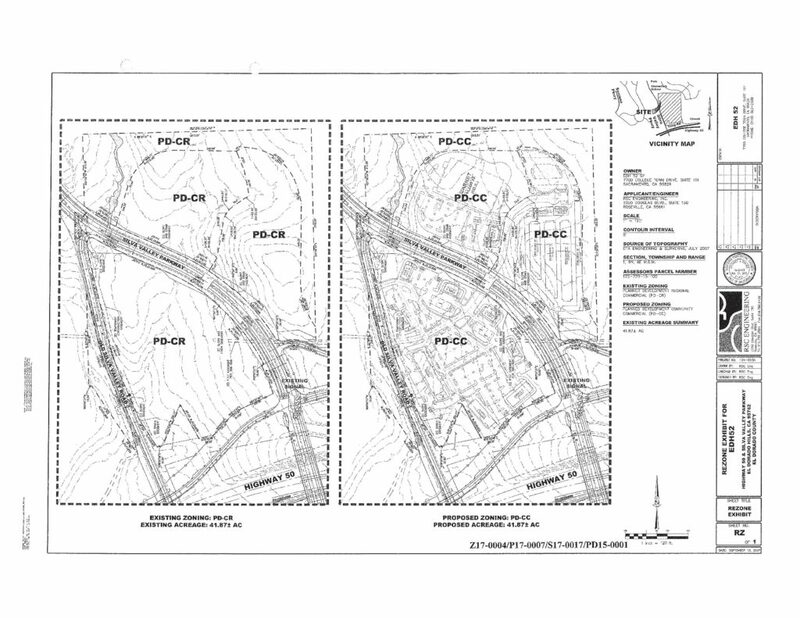 General Plan Amendment (A16-0001), Specific Plan Amendment (SP86-0002-R), Rezone (Z16-0004), Revision to Planned Development Permit (PD94-0004-R)/EL DORADO HILLS APARTMENTS (David Pick Family PTN LP/The Spanos Corporation/TSD Engineering): Proposed El Dorado Hills Apartments consisting of the following entitlements requests:1) General Plan Amendment adding a new policy under objective 2.2.6 (site specific policy section) increasing the maximum residential density allowed in the general plan from 24 dwelling units/acre to a maximum of 47 dwelling units/acre for the 4.565-acre site within the town center east planned development area. 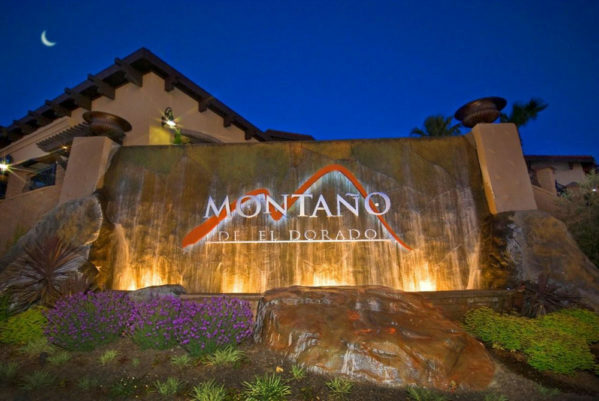 2) El Dorado Hills Specific Plan Amendment incorporating multifamily residential use, density, and related development standards for the project site. Subject site would be designated as “Urban Infill Residential” within the Village T area of the El Dorado Hills Specific Plan; 3) Rezone of project site from General Commercial-Planned Development (CG-PD) to Multifamily Residential-Planned Development (RM-PD) and revisions to the RM-zone district development standards applicable to the proposed 214-unit apartment complex development plan; and 4) Revision to the approved Town Center East Development Plan incorporating multifamily residential use, density, and related design and development standards for the proposed 214-unit apartment complex within Planning Area 2 of the Town Center East Development Plan. The proposed apartment complex would be contained in a maximum 4-story, 60-foot-tall building with a 5-story, 60-foot-tall parking garage and other amenities. 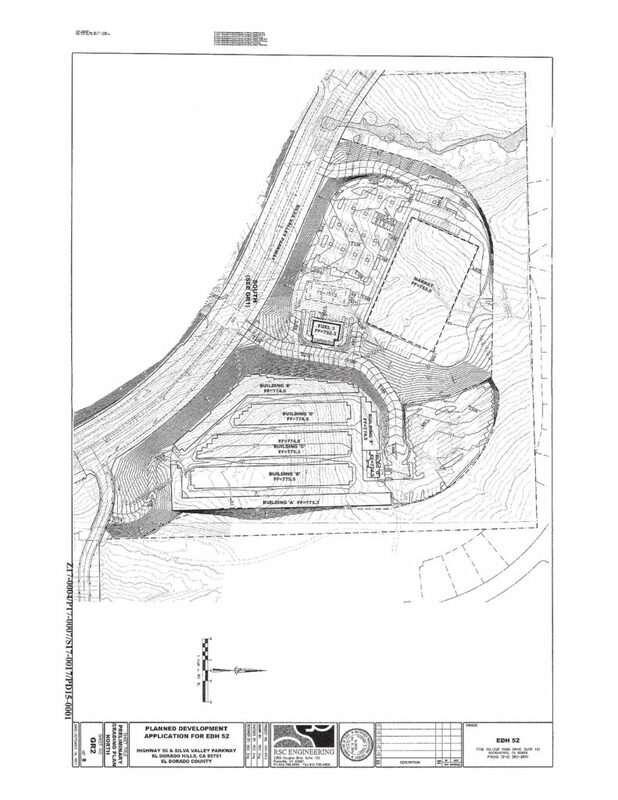 The property, identified by Assessor’s Parcel Numbers 121-290-60, -61, -62, consists of 4.6 acres, is located at the northwest corner of Town Center Blvd and Vine Street within the El Dorado Hills Town Center, in the El Dorado Hills area. Please note that a Draft Environmental Impact Report (DEIR), analyzing the potential project environmental impacts, has been prepared and may also be accessed from the web link provided above. Review and comment by your agency is requested for consideration by the County during application processing in order to develop conditions of approval for the project. Your agency’s written responses must be received by the Planning Services no later than September 4, 2017. If we do not receive written correspondence from your agency by that date, we will assume your agency has no comment and your agency’s concerns may not be reflected in our recommendations. The Technical Advisory Committee (TAC) will meet on September 11, 2017 to take one or more of the following actions; 1) Determine Final project conditions and/or, 2) Confirm the public hearing date. The meeting will be held in the El Dorado County Planning Commission Conference Room, at 2850 Fairlane Court, Placerville, CA. Please call this office one week prior to the meeting for the scheduled time. Technical Advisory Committee meetings are for agency discussion with the applicant and/or agent only. Other interested individuals may obtain project information by contacting the project planner. If you have questions or need additional information, please call Planning Services office at (530) 621-5355. 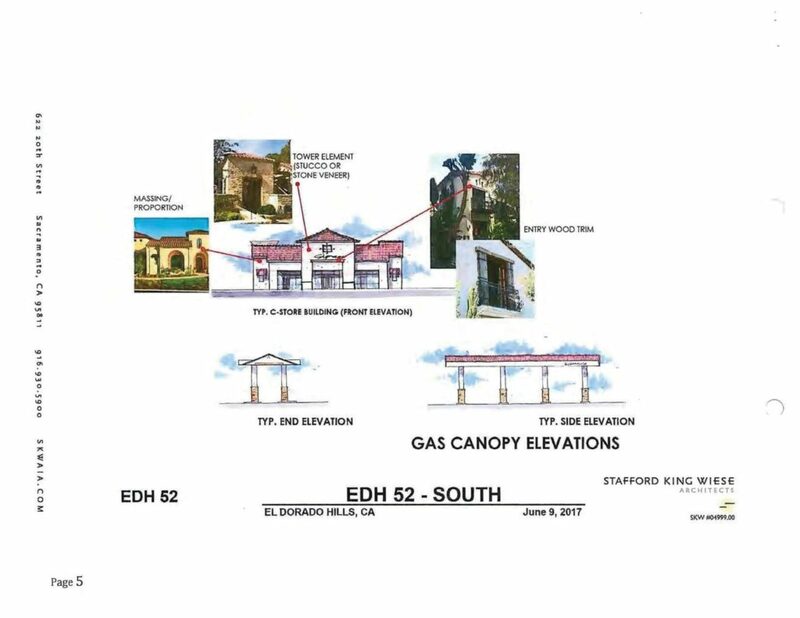 This project will be one of the issues discussed at the August 9 2017 EDH APAC Meeting at Fire Station 85 on Wilson Blvd in EDH at 7PM. receive verbal and written comments. 2-hour window to receive information on the Project or provide comments. building, a boutique hotel, and a small amphitheater to host occasional events (see Exhibit 3). between 24 and 50 feet in height, with some architectural elements reaching 70 feet. portion of the site with a maximum height of 43 feet. configuration to minimize and contain noise levels from travelling into nearby neighborhoods. down” area that gradually transitions to the lowered stage area. 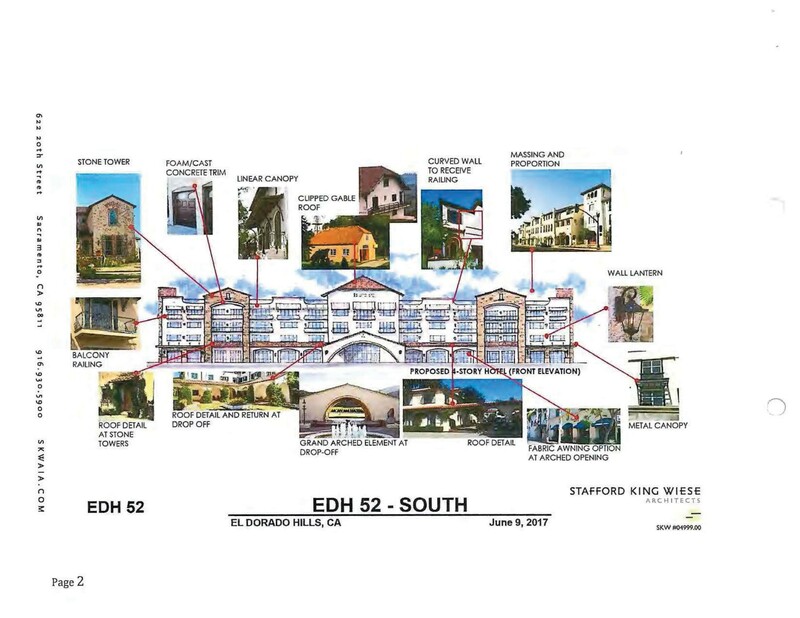 The El Dorado Hills Area Planning Advisory Committee requested a thirty day extension of the review period of the lengthy El Dorado Hills Apartments at Town Center Draft Environmental Impact Report ( File No. A16-0001, SP86-0002-R-3, Z16-0004, and PD94-0004-R-3 ), scheduled to be completed on August 14, 2017. The El Dorado County Community Development Services Planning And Building Department has responded with a fifteen day extension period. The public review period will now end on August 30, 2017. To implement the proposed development, the applicant is requesting an amendment to the El Dorado County General Plan (File No. 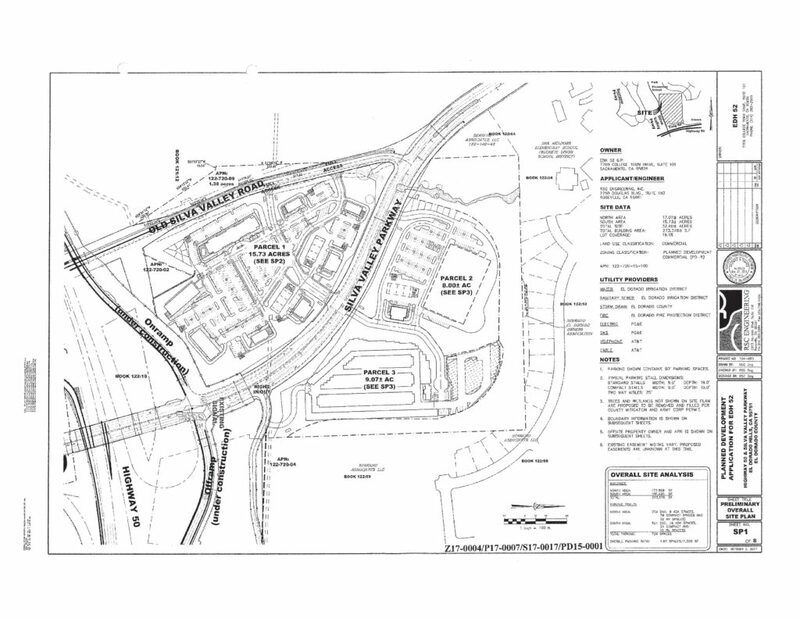 A16-0001), an amendment to the existing El Dorado Hills Specific Plan (File No. 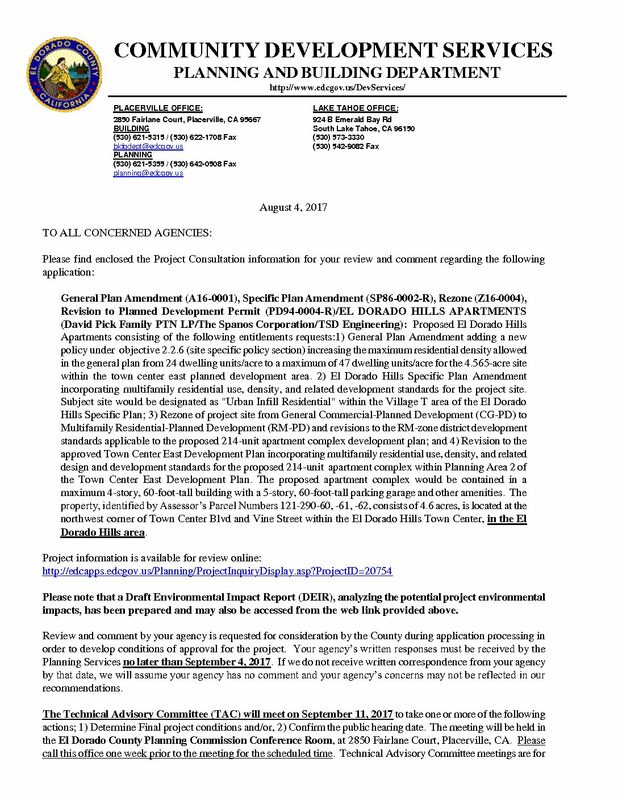 SP86-0002-R3), a rezone of the project site (File No. 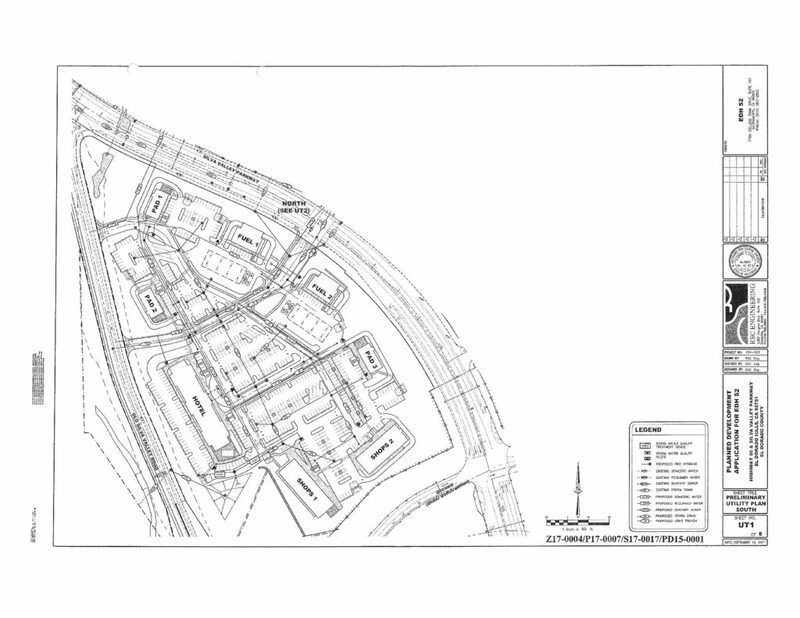 Z16-0004), and a revision of the approved Town Center East Development Plan (File No. PD94-0004-R3.